HUNDREDS TO CHOOSE FROM await the enthusiastic customer who is looking for something unusual to buy. Even more unusual is the customer can not buy a finished product hanging on the wall but must pick its duplicate from the shelves and finish the product. All articles range from 25 cents to $9 and are durable, practical and decorative. A hobby which appealed to the neighbors 15 years ago, has blossomed into a small neighborhood business. But the business is not the ordinary, where the customer enters, purchases something and walks out. At least that's not the business operated by Cherry Hill residents Mr. and Mrs. Gerald Kuhn, proprietors of the Marlton Plak-Shack. "The customer comes in and usually asks for a small plaque or something decorative to match Colonial, Mediterranean or Modern furniture," said Kuhn. "But what they find is a solid white casting, very sturdy and durable, made of gypsum composition harder than plaster of Paris that they must finish themselves." 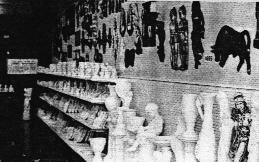 The castings range from candleholders to figurines to potters and over 1,000 artifacts are available. 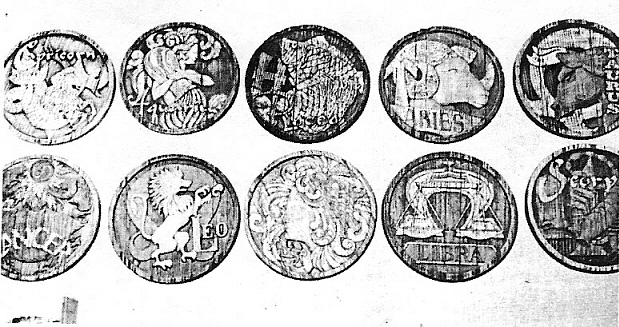 The finishes can be done in dozens of colors ranging from 20 to 40 cents each. Wood tones to antique finishes, bright colors to glitter effects, iridescent hues to solids, smooth or rough finishes are just a few ideas the customer has to work with. Cost Involved? According to Kuhn, "The least expensive plaque we have is 25 cents and the most expensive is about $9. The customer, using four or five colors to finish the product could spend up to $10 on our largest piece." One of the largest pieces stood over 2 feet high and could be used as a fishbowl, birdbath or flower pot. Most pieces cost $4 or $5, completely finished. The Kuhns are assisted by two artistically talented men who build molds, shape objects and create the "unfinished" product. Robert Frenzel and Dan Gayder are kept busy creating Kuhn's ideas, who has created thousands of castings over the past years (many on a trial and error basis). "Once the compostiton is poured into a mold," said Kuhn, "we must wait 45 minutes for drying. We then open the mold, remove the rubber liner which prevents sticking and clean the piece of excess marks, seams, material, etc. We level it as with a horse's head that would eventually be a lampstand, repair any imperfections and dry the product for 48 hours." The paints are special in that they will not wash off. They consist of a particular substance which adheres to the composition, yet can be refinished many times. Some of the paints are sprayed on, others are brushed on and a few are applied with the finger tips. The entire operation sounds difficult, yet is rather simple. "We have and will continue to give free demonstrations," stated Kuhn. "Most of the groups are ladies' organizations or woman's clubs that we have demonstrated for but we are willing to help anyone interested in this hobby. The one fault is that it's like a good book - once you start you can't finish". 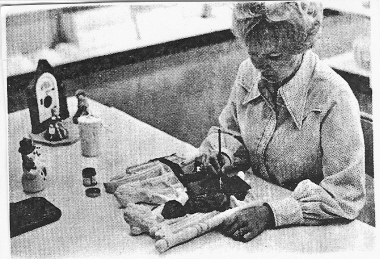 Mrs. Kuhn noted that many who try to finish a product are amazed how easy it is. "People come in and purchase something and don't understand how simple it is to get the beautiful effects - that's what happened to me when I started many years ago in our basement." The store does not cater to any particular clientele. Youngsters, oldsters and both sexes have found interesting and unusual items in the Plak-Shack. Don't go unless you're interested in purchasing something you can finish. And don't ask to buy one of the finished products in the window or on the walls - the Kuhns are willing to show the customer how easy it is to attain the same beautiful finishes they attained over the past 15 years. Mrs. Kuhn finishing a wall plaque. Getting an invitation to a press conference over the supper hour is not usually looked upon with great cheer by newspaper people. But when you get one which includes a ride in a helicopter, free drinks and a sample plak to paint, the idea gets downright attractive. So, the gathering of people at Marlton's Plak-Shack in the Marlton Square Shopping Center on Route 70, last Monday evening, was a happy one. We listened to the shop's proprietors, Jerry and Chris Kuhn, tell us how "anybody can do it" and strolled around the shelves admiring the results of what anybody can do. Everything form medieval shields, prancing horses to W.C. Fields stared back at us from the shelves, waiting to get spray painted and turned into decorator pieces. We saw snakes, airplanes, tree trunks, leopards and lots of Spaniards among the 1,600 pieces in stock. CREATING: Donna Kuhn, Cherry Hill, demonstartes how simple it is to turn a piece of Plak-Shack sculpture into a real looking tree stump by painting it brown and wiping selected portions with cheesecloth. But we didn't believe the part that "anybody can do it"-the stuff looked too good. Wood grain pieces looked like wood grain, we mumbled. How did you do it, we asked the omnipresent girls in hot pants. Very simple, they answered. All you need is this sculpture from the Plak-Shack, which is developed from a special formula and resembles plaster of Paris, but is non-porus and chip resistant. Then you get cans of spray paint and bottles of regular paint. Plak-Shack people have devised a foolproof system of instruction so even the most untalented of souls can never make a mistake with paint layers and drying times and special effects. 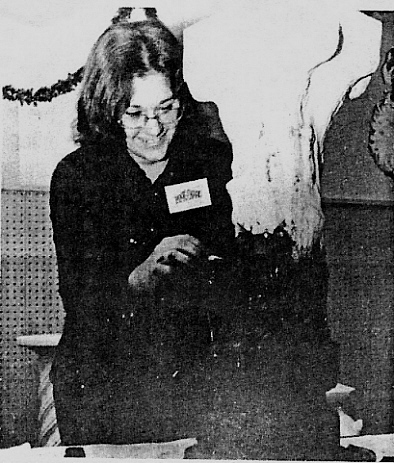 To demonstrate the technique, there was a young lady named Donna Kuhn, from Cherry Hill, painting away on a tree stump sculpture right next to the hor d'oeuvres. Before long, lots of people had painted a spot on the tree and it was beginning to look much like a tree stump by the end of the evening. Novices though we were, we had to admit that simply daubing on brown paint and wiping off the high spots with cheesecloth wasn't too complicated. But the results were convincing. It was a tree stump, with bark showing dark brown in the cracks and high spots lighter brown. Watching her and "helping" her cheered us up. We went bravely back down the shelves of unfinished masterpieces a second time, determined to find something we could turn into decorator pieces, suitable for Christmas presents. Girls in hot pants reassured the feeble-hearted that achieving the look of metal was "so simple"-all we had to do was touch the painted surfaces with tin foil. There is even a room in the back where free classes are given to those who can't master cheesecloth and tin foil in the privacy of their own homes. By the time the helicopter returned to transport the Philadelphia press back to the roof of the Holiday Inn, we were laden with parcels and exuding artistic self-confidence. Jerry and Chris Kuhn had assured us that we couldn't fail with their specially-developed sculptures and paints. And if we did fail the shop was always there to offer free advise. As one helpful lady mentioned, "you can always paint right over what you've done and start over with new colors if you like." One dosn't even have to wait long - the paint dries in 10 minutes. Best of all it only costs 25 cents per bottle. We left the Plak-Shack last Monday with the distinct feeling that lots of newspaper people's friends are going to receive original decorator pieces for Christmas this year. And those of us who don't have friends are going to have some very attractive creations hanging around the walls at home. PICK SIGN: These special-formula casts are created from a substance which resembles plaster of Paris but is much more durable and non-pororus. Paint from Jerry and Chris Kuhn's own laboratories can turn the placks into woodlike decorator pieces, after following directions provided with each sculpture. Everything is available at the recently-enlarged Plak-Shack in the Marlton Square Shopping Center, Route 70. By 1975, Plak-Shack had moved from it's original location in Marlton Square to a larger store on Route 73 in Berlin. This location also served as a warehouse for two branch stores in Burlington and Trenton, by this time called Plak-Shack Decor Centers. After the branch stores were closed, the Berlin location closed in November, 1980.